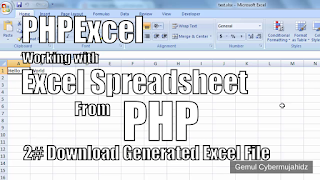 PHPExcel is a powerful PHP library (class) which allows us to generate and read Excel spreadsheet file in PHP server-side. Developed by PHPOffice team. Depending on the circumstances, generating an excel spreadsheet file as a reporting medium is a great way to present reporting data in offline, independent manner. Especially when dealing about printing and lots of numeric data such as financial report. Reading an excel file using PHP is also a good way to automate data entry. Especially when dealing with batch data entries. And on the end-user side, this method will also ease the user as the interface for entering the data is an excel spreadsheet file which most people are familiar with. And absolutely more agile when compared to web-interfaced forms. To use this library, simply download the library files here. Extract it anywhere in your web root directories. Call the PHPExcel.php file in your script and you're good to go. Here's a Hello World PHP script example to generate an excel file. I think the comments in pretty self-explanatory. You can choose in what format the excel file will be generated by uncomment/comment the headers and IOFactory line. And here's the video if you need a step-by-step explanation. Part #1 How to install and test php excel (basic usage). 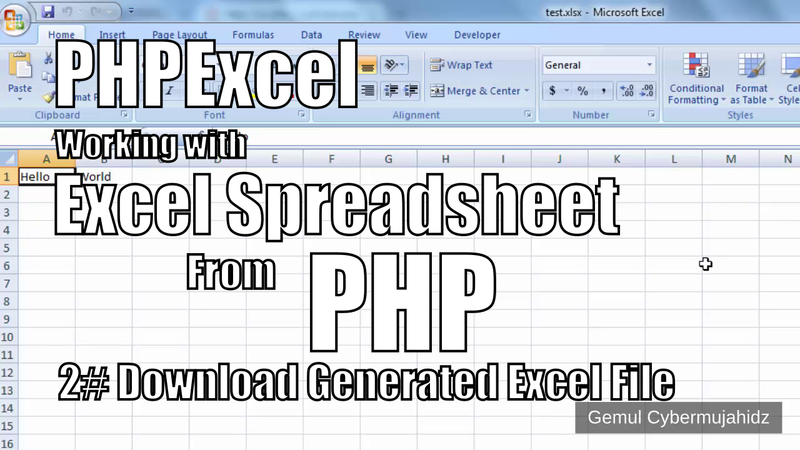 Part #2 Download PHP Generated Excel File. Nice post.It Was simple and Effective..Thanks for sharing your valuable information and time. Please keep updating. Good Post! Thank you so much for sharing this pretty post, it was so good to read and useful to improve my knowledge as updated one, keep blogging.. The information you have here is really useful to make my knowledge good. It is truly supportive for us and I have accumulated some essential data from this blog. No.1 MCSE and MCSA Certificate Exam Centre in Chennai |No.1 MCSE and MCSA Certificate Exam Centre in Chennai. now without mention the column headers of this file in your php file can we upload it automatically to the server and a database will be created with the column headers as name emailid and company. Thank you for sharing this valuable information. Good job. It is an interesting post, helps me for my work. I like it, Thank you for sharing with us. Thanks for sharing this tips admin. It gives lots of information to me, continue sharing more like this. Awesome Post!! Keep posting more content. Awesome Post. Your writing is very unique. The choice of words stood as an exemplary piece of work. Thanks of sharing. Thanks for your sharing the knowledge to needed ones. Waiting for your updates. Keep it up. Awesome Post. The choice of words makes this post very unique. Great content. Thanks for sharing. nice thoughts you have attached in your post.surely i look into this insight and gather lot of new ideas.please update such Kind of information's more in future. Exciting online games with us best casinos online come in and win right now. Great Blog!!! Thanks for sharing with us... it is more useful for us..
You are an artist. Your website is very unique. Your content is very interesting to read. Waiting to read more.